It would be terribly remiss of me not to do a double rainbow post, so here we go! 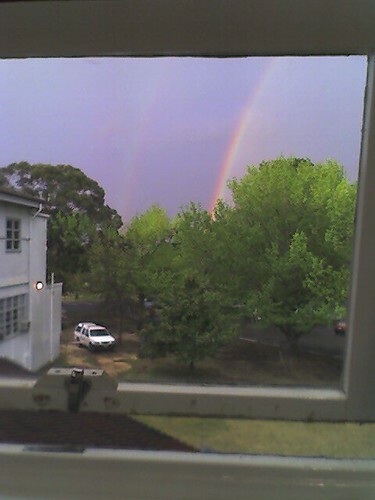 As it happened, yesterday I was looking through a photograph collection and uncovered my own Double Rainbow - captured on camera on location in Australia back in 2005! Now isn't that a coincidence? I was given a calendar last Christmas from a 'Secret Santa'. It's quite a nice one - with a quote for each month. I thought I'd mark September by posting the picture for this month from the calendar. Enjoy! Well, as a soon-to-be ex-Vox blogger, we were all notified yesterday that Vox was sadly shutting its doors by the end of September, and one of the options was to migrate over to Typepad. I have to say, it was a painless transfer and it only took about 6 or 7 minutes to do and most of it was done automatically. Very nice! Slightly less painless was transferring entries from my 2004-2006 blog Inspiration not Expiration hosted on blogdrive.com. After some manual pruning of entries, they've been consolidated into this blog as well. In all honesty, in recent years I've been updating my Facebook and Twitter pages more, and I'm not a great fan of mixing the different formats up and it's very rare that I find the need to post the same thing everywhere! Seeing as the blog is now settled in its new home for now (Vox will shut and the old link will redirect here), I guess it might be a good reason to post more here. Hopefully this is the start of more regular posts! I just had a look at the [no longer] new UK O2 Simplicity (sim-only) contracts. Wow, on the one hand they’ve beefed up the inclusive texts to an unlimited text message quota but on the other, they’ve taken a lot away! Just a bit of a picture postcard from near Newcastle. This was taken at the foot of the Angel of the North, a rather interesting monument which keeps watch over the countryside. I decided to choose the black and white look for this image simply because it conveys an ethereal quality in this format. The slight aura effect around the people in this shot is purely accidental, but seems quite fitting! I still play CDs in my car. I know some people prefer to have iPods and mp3 players playing all their favourite tracks these days, but when it comes to in-car audio I'm stuck with either the radio or the CD player. One of the things about CDs is that sometimes if you don't label them very well (I'm guilty of this), you don't really know what you're going to get! Quite by chance, I put in a CD that I'd burnt some time ago, and hadn't listened to in a while. It was great listening again to songs that I'd liked before, but hadn't heard for a long time! Uploaded by liismari. - Watch more music videos, in HD! I found out by chance that Delta released the song in the US, but it was a slightly faster-paced version of the song, with a glamourous music video to go along with it! Personally, I think the original has more punch and character to it, though I like the US version too! See what you think. I found a thread on an online forum of funny (and not-so-funny) jokes of lines Horatio Caine might say just before the opening credits roll on CSI: Miami. I thought this one was rather amusing! Her ideas may not be conventionally scientific, and I'm sure some people may wonder if the stroke did something more to her, but I would encourage you to consider the message, even if you doubt the messenger.